Description: Sexes similar. Unpatterned warm brown above; white to grayish-white below; distinct long white eyestripe; white outer tips of tail feathers are conspicuous when the tail is fanned. Behavior: Unique habit of slowly flicking the tail sideways. Habitat: Found in open woodlands, brushy habitats, farmsteads, and towns. 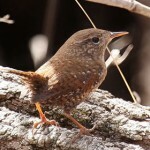 In the eastern part of their range they overlap with the House Wren in their habitats. 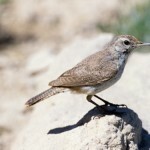 Where in Nebraska: Uncommon or rare spring and fall migrant and summer resident in southwestern Nebraska. Status: Populations are sharply declining east of the Rockies, especially in areas east of the Mississippi. 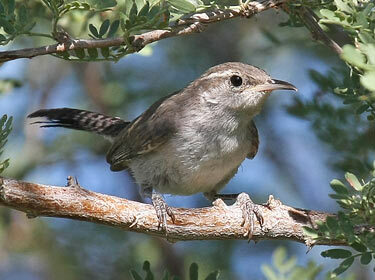 Field Notes: Western birds are much grayer. Fun Facts: Bewick’s Wren males learn their song while they still live within its parents territory but learns to mimick the neighboring males song. That song becomes their song for their whole life.